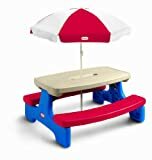 We enjoy this table for outdoor fun, snacks, meals, crafts etc. To clean up we hose it off! It was very easy to put together, and very durable. It’s legs are wide enough to support an adult on one side without tipping and can easily be placed on cement or grass. The umbrella is a must in our sunny state. The cup holders are good if you have 2 kids but if you have more, they make great bubble bottle holders. We ordered this one after returning another table that was cheaper and very wobbly. This one is perfect! It works great for my kids ages 8, 6, 4, and 1. It is great for coloring, eating, play doh, and the umbrella is really nice. 2 kids fit comfortably on each side, though 3 could fit if necessary. It’s low enough that I don’t worry about my 1-yr-old falling off, but big enough to fit my 8-yr-old just fine. It’s sturdy, and the seats are not sagging at this point, anyway. This one’s going outside–I’m almost tempted to get another one to keep indoors! Little more time w/ set-up than expected; instructions not the greatest but able to figure out. Son loves the table from the start. Great for eating or drawing or other play. Folding capability is great! Love the umbrella option. Light weight so easy to carry. Fits through most doors even when not folded. Highly recommend this table.